Has Mark McKenzie played himself into the starting 11? Philadelphia Union center back Mark McKenzie had quite the game in Montreal on Saturday. It wasn’t flashy. It wasn’t dazzling. It was a quiet, subtle performance. In other words, it was exactly the type of display a coach wants from a defender. McKenzie’s showing was enough earn his the lofty honor of being PSP’s player of the week. But was it good enough to keep the 19-year-old homegrown in the Union’s starting 11? The man McKenzie could be replacing is second-year center back Jack Elliott, who has started 37 of the Union’s last 39 games since his first MLS start on Apr. 14, 2017 against New York City FC. The Scot from London — who finished third in last year’s Rookie of the Year balloting — was left out of the lineup on Saturday due to a combination of a busy week and a dip in form. The only other start Elliott missed in that stretch was due to injury, against FC Dallas this year. 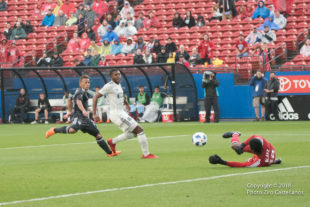 That match also marked the first MLS start of McKenzie’s professional career. Unlike the game against Montreal, no one came away believing he was ready to challenge Elliott. Against Dallas, McKenzie looked every bit the untested rookie that he is. He struggled to track the runs of Dallas’ attackers as the midfielders played long balls behind Philadelphia’s back line. And it makes his performance against the Impact stand out all the more. Not only did McKenzie adjust and improve from one game to the next, but he helped shut down one of the the best attackers MLS has to offer in Ignacio Piatti. Despite the praise and acknowledgement, Curtin made it clear that the job doesn’t belong to any one player. According to the coach, matchups will often determine who gets the start. If Curtin needs a player with more pace and grit, McKenzie might get the nod. If he needs someone to distribute and defend crosses, Elliott is his answer. The catch is that these two center backs might end up pairing together rather than competing for the same role. Curtin did mention the U.S. has hinted at going younger during this camp, and Sarachan stated more MLS players would be involved in the camp leading up to the Memorial Day match against Bolivia. With an upcoming suspension this weekend stemming from a red card against Montreal Impact, forward Cory Burke will start for Bethlehem Steel tonight to stay sharp. With Burke unavailable, will forward C.J. Sapong be ready to go against Real Salt Lake? “C.J. is still not training with us on the field,” Curtin said. “The contusion on the quad is a big concern. There’s a little bit of a carryover to the groin.” If the Union’s top two options at forward can’t go, Curtin mentioned the answer could be Jay Simpson or a “false nine” like Fafa Picault or David Accam. Looking ahead to Real Salt Lake, Curtin identified one key player: attacking midfielder Albert Rusnak. “RSL has a very good front four. They’re dynamic. And it starts with defending Rusnak.” Curtin mentioned the Slovak’s efficiency in shooting from beyond the box and the need for defenders to close his space. “We’re built to play ahead. That’s the bottom line.” If I could figure out how to stammer and stutter while typing that line I would. WTF? Knife to gun fight teams, aren’t built to play from ahead. NO. Just no. I don’t care if there is even a semblance of truth to this, he doesn’t get to say it. They’ve given only a semblance of being able to do it. It occurs to me I’m taking this out of context. Maybe someone else sees this differently? Playing the ball ahead maybe? Please tell me that’s it. Otherwise it’s just mind bending. Is this some sort of Maurinho type mind game for his players? I just don’t get it. Curtin’s comments just infuriate me on every other sentence at this point. He’ll say something relatively intelligent then stick his foot in his mouth without missing a beat. You ask for an alternative interpretation of the quote, All4U. Your second paragraph gives my best instinctive initial guess. Your first draws the inference that a word is omitted and adds your guess of it, something all of us do as habit in this day of hyper/Supra quantities of writing by keyboard. I fully agree that the quote is cryptic. Thanks Tim. I did realize my inference having slept on it. I hope this is the case. I really don’t want to believe he meant what I first thought. Curtin said this as to say they are built to play with the lead. It’s difficult for them to chase games. A false nine? Bedoya on the wing? Yeah right. We’ll see the same formation with Fafa trying to be CJ (and failing) and Bedoya in the same central position as usual. So the U are not built to play a game that starts 0-0.